Interface separation: Process or Bakelite? / Interface separation: Process or Bakelite? I am spraying Copper Nickel Indium onto a Titanium 6-4 coupon with no bond coat. Before I share any parameters, I wanted to explain my problem. Basically, I am getting a black line at the interface under the scope. The funny thing is, the black line is appearing even where there is no coating at all. I will try to attach a picture, so you can see what I am seeing. 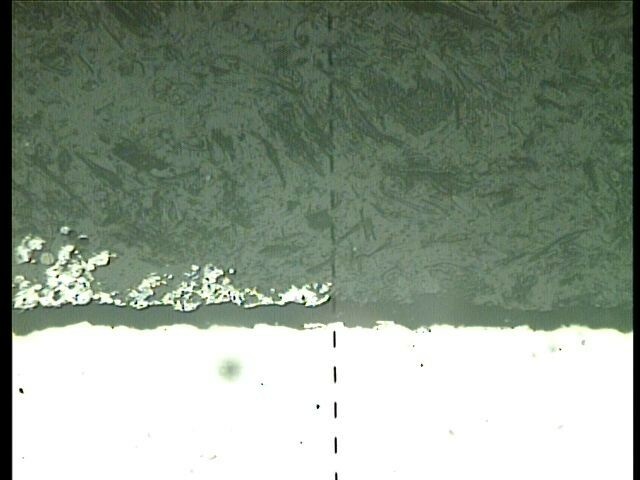 The picture shows coating (Cu-Ni-In) on the left half and no coating on the right half, but the black line is apparent throughout. Any ideas as to where or why this line is appearing would be great. Thank you all!!!! RE: Interface separation: Process or Bakelite? Could you email the image to me at sef@gordonengland.co.uk and I will place it into your post or alternatively see image-photos-in-posts. The black line could be down to a polishing relief effect (my guess at the moment). The dark area between substrate and coating/bakelite appears to be a separation of the coating and bakelite mounting medium away from the substrate. The fine dark line on the underside of coating is probably an optical effect. I would consider using cold mount epoxy resin, ideally using vacuum impregnation. If this is not an option then your bakelite mounting procedure is worth looking at, as sometimes losing pressure during cooling can cause the bakelite to pull away from your sample.